This year, Finisar marks its 30th anniversary in the optical components and subsystems business. I recently sat down with Michael Hurlston, who took over as CEO in January following the retirement of founder Jerry Rawls. Hurlston previously served as a Senior Vice President and General Manager of the Mobile Connectivity Products/Wireless Communications and Connectivity Division at Broadcom. Finisar has more than 1,000 US patents and over 13,000 employees worldwide, with its HQ in Sunnyvale, California and additional product development and manufacturing facilities located in California, Pennsylvania and Texas (USA), Australia, China, Germany, Malaysia, Singapore and Sweden. Its portfolion spans optical transceivers, active optical cables, optical engines, communication and sensing components, wavelength management devices, RF-over-Fiber transmitters, and optical instrumentation. Jim Carroll: Tell me about Finisar, the 30th anniversary, and the company’s strategic direction, especially in regard to the hyperscalers. How has the vision of the company changed over time? Michael Hurlston: Finisar is one of the longest and most successful companies in optical communications and with an incredible history. For any company to survive for 30 years is a remarkable achievement, especially for one that has a huge manufacturing component, such an important part of our story. The credit belongs to our founding CEO, Jerry Rawls, who guided the company for all of those 30 years. It was an incredible run for both the company and for Jerry. Now that he has stepped down, I've come in at a true inflection point in the history of optics. Your question about the hyperscalers is right on target because they are driving a lot more of the decision making in optics than ever before. The major network equipment OEMs, like Cisco or Nokia, are still very influential in setting the course of the industry, but clearly, the hyperscalers are becoming more influential. And each of the hyperscalers has a different way to build data centers, both inside the building and between nearby and distant data centers. They think about these things very differently. Each of the big ones has a different way they employ optics. In addition, a lot of these guys are buying optics directly. They are moving to a disaggregated model, where instead of procuring attached optics from companies like Cisco, Juniper or Arista for their network switches and routers, it is now a separate decision. They are buying optics from companies like us, and buying switches and routers from companies like Cisco and Juniper. It is a very complicated landscape and one that brings opportunity for us. Jim Carroll: You’ve recently taken on the CEO position at Finisar. What attracted you to this company? Michael Hurlston: It is an unbelievable opportunity for somebody in their first role as CEO to come in to a company like Finisar with a such a great history and a number one market share. Usually, first time CEOs are doing ‘fixer uppers’, the difficult task of trying to save a distressed asset. The opposite is true here. Jerry built quite a legacy in terms of employees that make this company what it is. This is a great opportunity for me. To be truthful, I didn't know much about optics. My professional focus for the past 15 years has been around mobile phones. So as we look at this mobile opportunity and other consumer opportunities, I understand that quite a bit. Secondly, I know how to build successful partnerships. In this new world of optics and data networking, we have to think differently about vertical integration, where it makes sense, and where we should adapt. I may be driving people crazy with all my questions about why we do things this way. Probably 95% of the time the answer is that we have been doing things the right way. But 5% of the time, we may conclude that the old way of doing things is no longer optimal in this current landscape. Jim Carroll: What is the company's core expertise? Its key differentiator? Michael Hurlston: We do two things extremely well. Number one, we're one of the very few companies that have our own component set. If you look at the landscape of optical networking, particularly for transceivers, there are two classes of company: one that actually assembles the transceiver and puts together all the components, wraps it up, tests it and then ships it to the end customer; and, two, companies that actually make components that go inside the transceiver, which are really the heartbeat of what the transceiver does. We're the one company that actually does both. We make the components and we have great strength in lasers, in particular. We manufacture all different kinds of devices, including lasers for coherent optics, long range optics, multi mode and VCSELs (vertical-cavity surface-emitting lasers), etc. We manufacture the whole landscape of lasers, which is a big core competency. We actually make our own ICs as well, along with key drivers, laser drivers, and re timers. . We also have the second piece, which is assembly and test and when you put these two pieces together, you see that Finisar is very different from the vast majority of our competition. Jim Carroll: Every generation in silicon is increasingly difficult. In the optics field, of course, there are even more technical challenges as you move ahead. Can the industry keep up the pace in moving to 400G and beyond? Michael Hurlston: Yes, I think that you're raising a great point.. Optics are becoming like semiconductors and more specialized over time. We’ve just talked a bit about the specialization in assembling modules and then making components, but even within the making of components, you've got different tiers of suppliers. In core optics, there are several paths opening up for manufacturing transceivers because the market is fragmenting. The hyperscalers are each taking different approaches as well. What you find is that companies who are specializing and concentrating on specific customers or parts of the market tend to do better. We’ve seen competitors focus, for example, on coherent optics. We’ve also seen competitors focus on one or two of the hyperscalers, and they've done well. What Finisar needs is to focus on is our role as a total supplier, which we’ve been very successful at in the past and which is really about vertical integration. Also, focusing on a few key areas of the market where we see the most opportunity, instead of trying to serve every need, which has been a characteristic of our past. Jim Carroll: What is the high-end target for Finisar? Michael Hurlston: We see increasing opportunities for our components in both core optical networking and mobile. For our module transceivers, we will focus more on the high end -- 100G, 400G and beyond – and perhaps do less of what we've done before.Regarding mobile, there is a big opportunity in upgrading the metro transport networks. Over the years, we’ve made millions of VCSELs for core optical networking, and this will continue. However, there is another huge opportunity related to the use of our VCSELs in handsets for facial recognition. In fact, we’re ramping up a new 700k square foot manufacturing facility in Sherman, Texas to pursue this opportunity. As you and other members of the media have reported, we are building this facility with the support of a major customer who is already using facial recognition in smartphones. Jim Carroll: Are there other applications that you anticipate for VCSEL technology? Michael Hurlston: Sure, there are a number of really compelling possibilities, and we wouldn’t have begun construction of a factory this size if we didn't see multiple opportunities. Gaming is a clear winner. Imagine if you could do really great gesture recognition. The same thing goes for virtual reality. We're also seeing applications in automotive. Think about advanced sensors in the cabin that are able to detect a driver falling asleep, or not paying attention to the road and an accident is about to happen. There could be applications in vehicle-to-vehicle communications, LiDAR, and other means of detecting objects like approaching vehicles using visual technology. Cool stuff. Jim Carroll: Let’s jump back to data centers. We’ve talked a little about hyperscalers and their unique network designs. It looks like the industry is just on the cusp of making the next jump to 400G? How do you see that technology coming along, especially compared to the 100G transition? Michael Hurlston: 400G is coming and people are thinking about it and preparing in different ways. Our view is that we'll probably see the first shipments of 400G at the end of 2019 and going into 2020. I think the transition will be similar to 100G, where we had some slowness in the beginning, perhaps slower than people anticipated. But then suddenly, there was a tidal wave of deployments as most of the hyperscalers converted from 40G to 100G. I think this 400G transition is going to be very much along the same lines, where a slow ramp suddenly turns into a dramatic transition. But I'm not sure it's going to be 2019 or 2020 when that uptick will occur. More likely, you'll see the beginning of the curve in late 2019, and more of the meat of the curve in 2021 or 2022. Jim Carroll: Tell us about the enabling technologies that have to come into play for 400G to really have legs. I mean, when you push 400G into a tiny little device, you've got the heat problem, you’ve got the difficulty of very tight fiber alignments. Don’t these impact the manufacturability of 400G devices, the yield? Michael Hurlston: You've asked a valid question about the degree of difficulty in terms of manufacturing. What we’ve seen is that Chinese module manufacturing competitors have become very adept at 100G. At 400G, the challenge is much tougher. The optical alignments are going to become very difficult as the number of lasers goes up -- let's say, from four to eight, or in some instances, from two to eight. Depending on what technology you're talking about, it becomes very challenging to couple the light into the fiber.. Finisar has the ability to differentiate because we’ve developed our own tools for optical alignment and as such, we are able to align optical sub-assemblies properly with the fiber. We think we can deliver differentiation in that manufacturing process for 400G. One of the approaches here is silicon photonics, which has been talked about for quite some time and is one of our areas of R&D. I think we'll begin employing that more frequently in our future 400G products. Jim Carroll: What do you think about on-board optics? Is it further out? Michael Hurlston: Yes, I agree with what you just said, it is interesting but further out, at least in our view. I'm not sure we see it at the 400G node, but perhaps at 800G or terabit-class speeds. What's interesting here is that the interface now, between an optical transceiver package and a back plane, is going to cause loss. It's going to cause optical signal noise ratio issues, and a lot of other undesired effects. So people are talking about co- packaging, or bringing the optics right next to a switch or to a processor chip and, and eliminating some of the losses that happen in high frequency applications. We're looking at that challenge as well. I think the whole industry is. However, I don't think on-board optics happens at this transition, probably the next one. Jim Carroll: To lead the optical components market you must be an R&D centered business. How important are industry partnerships to you? Where are your strategic alliances moving forward? Michael Hurlston: This question really gets to the heart of our transition from the Finisar of the past 30 years to our vision for the future, which is really much around alliances and partnerships. Historically, we’ve believed in a heavy level of vertical integration, where almost everything in a Finisar optical transceiver came from Finisar. That has been an unbelievably good strategy for getting us to this point. But because of the way the market is changing, because of this diversity of opportunity, and because of specialization, we now must think carefully about where to invest in R&D and where to pursue partnerships. It is a challenge to change any company’s culture, especially when it has been successful with one way of thinking. We are now looking for opportunities to partner-- whether that be in manufacturing, whether that be in supplying components, whether that be buying lasers outside, or whether it be in selling lasers to some of our competitors, as some of our competitors have begun to do -- all of these are new to Finisar, and I think we're going to be well served by shifting gradually to a less vertically integrated strategy and moving toward one more willing to partner. I know that we've hired some of the best R&D engineers on the planet; we're not number one by accident. But I think in certain instances, the dependency on everything happening in-house because of vertical integration, where our components have to line up with our manufacturing strategy – this can be a challenge. Jim Carroll: US-China trade tensions have been a concern this year. What are your thoughts? Michael Hurlston: China is a very important market for us and a reasonable portion of our business. However, we don't have as much exposure as some of our competitors. One aspect of the Chinese market that is worth talking more about is wireless infrastructure and the coming 5G upgrade cycle. China definitely seems to be taking a lead here. We've got to figure out how to properly partner both with the telecom operators in China as well as the infrastructure suppliers, especially Huawei, ZTE, and Fiberhome. Jim Carroll: A lot of consolidation is happening among optical vendors. Is getting bigger the best way to compete? Michael Hurlston: The topic of industry consolidation comes up again and again. I come from the semiconductor world and for the past five years, mergers & acquisitions has been the name of the game. It became the new normal. We’ve seen huge companies doing roll ups -- and my former company (Broadcom) being one of the best at it. I think the situation in this sector is much different because there is a fissure between the transceiver suppliers, the assemblers of goods, and the component companies. Generally speaking, I think it's much more difficult to consolidate the optics industry than the semiconductor industry. With that said, there was a second part to your question, which was, is bigger better? Of course! I do think that that's true and getting our market valuation up is certainly task number one for me. I seek to do that through organic moves and making sure we're driving our stock price up. But inorganically, we will look at things that could give us some more bulk. Qualcomm confirmed that its upcoming 5G system-on-chip (SoC) will be implemented on a 7nm process node. The 7nm SoC can be paired with the Qualcomm Snapdragon X50 5G modem for premium tier smartphones and other mobile devices. Qualcomm Technologies has begun sampling of its upcoming flagship mobile platform to multiple OEMs developing next-generation consumer devices. 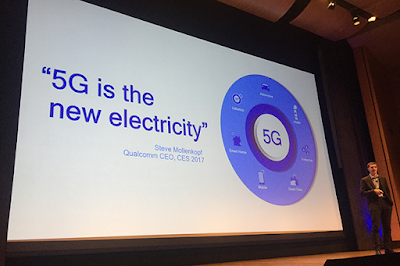 Qualcomm Technologies has begun sampling fully-integrated 5G NR millimeter wave (mmWave) and sub-6 GHz RF modules for smartphones and other mobile devices. The Qualcomm QTM052 mmWave antenna module family and the Qualcomm QPM56xx sub-6 GHz RF module family pair with the Qualcomm Snapdragon X50 5G modem to deliver modem-to-antenna capabilities across several spectrum bands, in a compact footprint that is suited for integration in mobile devices. The QTM052 mmWave antenna modules work with the Snapdragon X50 5G modem. They support advanced beam forming, beam steering, and beam tracking technologies to improve the range and reliability of mmWave signals. They feature an integrated 5G NR radio transceiver, power management IC, RF front-end components and phased antenna array. They support up to 800 MHz of bandwidth in the 26.5-29.5 GHz (n257), as well as the entire 27.5-28.35 GHz (n261) and 37-40 GHz (n260) mmWave bands. Qualcomm says that up to QTM052 modules can be integrated in a smartphone, enabling OEMs to continue evolving the industrial design of their mobile devices, offering attractive form factors combined with the benefits of extremely high speeds from mmWave 5G NR, and making such devices available for launch as early as the first half of 2019. The QPM56xx RF module family (including the QPM5650, QPM5651, QDM5650, and QDM5652) is designed to allow smartphones based on the Snapdragon X50 5G modem to support 5G NR in sub-6 GHz RF bands. The QPM5650 and QPM5651 feature integrated 5G NR PA/LNA/Switch and filtering subsystem. The QDM5650 and QDM5652 feature integrated 5G NR LNA/switch and filtering subsystem for diversity and MIMO support. All four modules offer integrated SRS switching required for optimum massive MIMO applications and support for 3.3-4.2 GHz (n77), 3.3-3.8 GHz (n78) and 4.4-5.0 GHz (n79) sub-6 bands. These sub-6 GHz RF modules provide mobile device makers with a viable path to delivering on the promise of 5G NR massive MIMO technology in mobile devices. Qualcomm and the Datang Telecom Group, also known as China Academy of Telecommunications Technology (CATT), have conducted a multi-chipset vendor interoperability test of 3rd Generation Partnership Project (3GPP) Release 14 C-V2X direct communications (PC5) Mode 4, which is also referred to as LTE-V2X. The cross-chipset interoperability test, which was held at Qualcomm Wireless Communication Technologies's Beijing lab, utilized the Qualcomm 9150 C-V2X chipset and Datang’s LTE-V2X module, the DMD31. Qualcomm said the testing reflects the maturing state of C-V2X radio technology and applications to improve automotive safety, automated driving, and traffic efficiency. C-V2X is based on the global 3GPP Release 14 specifications for PC5-based direct communications in the 5.9 GHz ITS spectrum where vehicle-to-vehicle (V2V) and vehicle-to-infrastructure (V2I) messages for collision avoidance can be sent without any dependency on cellular operator network involvement. 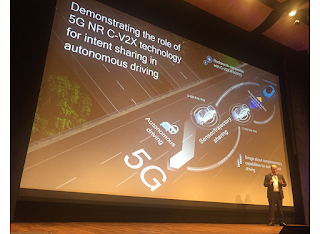 Qualcomm notes that C-V2X is also the only V2X communication technology with an ongoing evolution designed to offer forward compatibility in implementation with 5G NR C-V2X. The Australian government issued guidance to mobile operators requiring them to protect their networks and facilities against threats to national security from unauthorised access or interference. 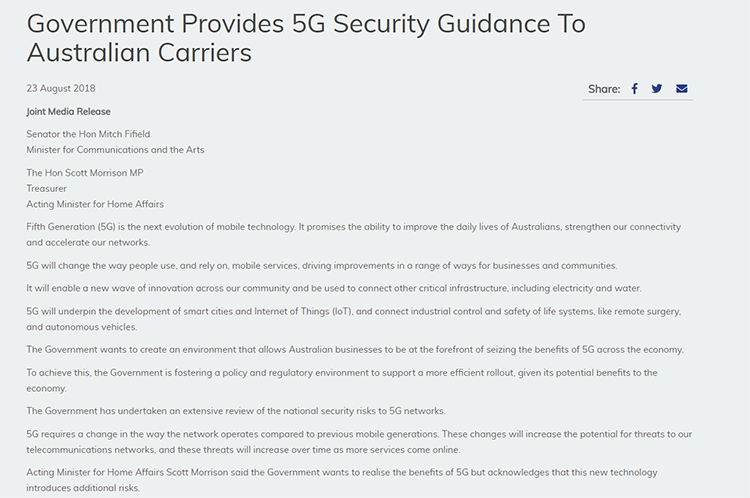 The guidance prohibits vendors "who are likely to be subject to extrajudicial directions from a foreign government that conflict with Australian law, may risk failure by the carrier to adequately protect a 5G network from unauthorised access or interference." Acting Minister for Home Affairs Scott Morrison said the Government wants to realise the benefits of 5G but acknowledges that this new technology introduces additional risks. 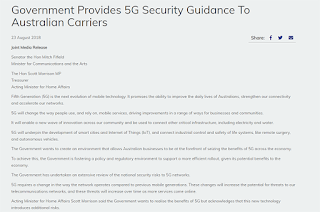 “The security of 5G networks will have fundamental implications for all Australians, as well as the security of critical infrastructure, over the next decade,” Mr Morrison said. Samsung Electronics Co. unveiled its new narrowband (NB) Internet-of-Things (IoT) chip. The Exynos i S111 integrates a modem, processor, memory and Global Navigation Satellite System (GNSS) into a single chip design to enhance efficiency and flexibility for connected device manufacturers. Samsung said its NB-IoT solution offers extremely wide coverage, low-power operation, accurate location feedback and strong security. It is optimized for real-time tracking applications such as safety wearables or smart meters. The Exynos i S111 incorporates a modem capable of LTE Rel. 14 support that can transmit data at 127-kilobits-per-second (kbps) for downlink and 158kbps uplink, and can operate in standalone, in-band and guard-band deployments. NB-IoT adopts a data retransmission mechanism that continuously transmits data until a successful transfer, or up to a set number of retransmits. With a high number of these retransmit sessions, the S111 is able to cover the distance of 10-kilometers (km) or more. 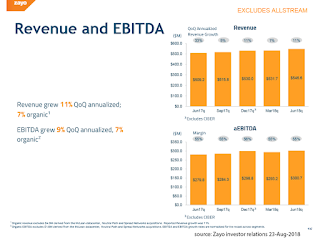 Zayo Group reported $657.6 million in consolidated revenue for its fourth quarter ended June 30, 2018, and net income of $43.8 million, including $30.6 million from the Communications Infrastructure segments and a net income of $13.2 million from its Allstream segment. Fourth quarter operating income increased $14.9 million and net income increased by $20.4 million over the previous quarter. 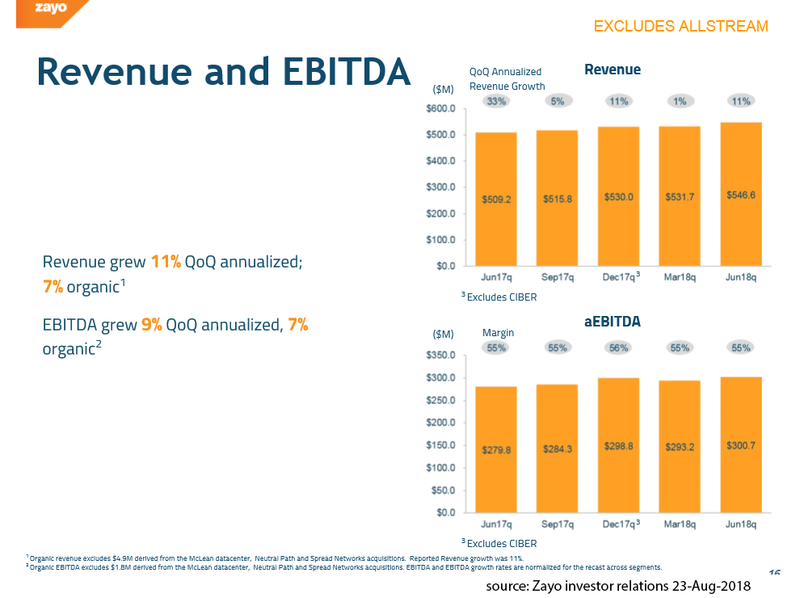 Basic and diluted net income per share during the quarter was $0.18. Capital expenditures during the quarter amounted to $208.0 million. Zayo also noted that it completed the first phase of its investigation on the advisability and feasibility of a conversion to a real estate investment trust (REIT) for U.S. federal income tax purposes. Zayo announced a contract to provide multiple 100G wavelengths to an international telecom carrier to connect its new point of presences (PoPs) in North America. The name of the carrier customer was not disclosed. Zayo's solution, which also includes multiple 10G routes, is part of the customer's global 100G upgrade to support its cloud connectivity platform.